This article by Craig Shuttleworth, Honorary Visiting Research Fellow, Bangor University and Matt Hayward, Associate professor, University of Newcastle is republished from The Conversation under a Creative Commons license. Read the original article. The pine marten – cute but cunningThe pine marten is a small native carnivore that inhabits a range of woodland habitats. It’s an excellent climber and often nests within tree cavities. This opportunistic predator has a varied diet including fruit, eggs, songbirds and small mammals. By the 1920s, pine martens were virtually extinct in the UK after centuries of persecution to protect game birds and poultry. Only a population in north-west Scotland and small numbers in northern Wales and England survived. With UK legal protection, their range has expanded since the 1980s, increasing their encounters with the grey squirrel. 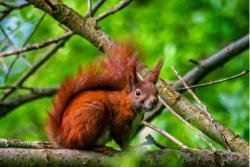 Since George Monbiot penned “how to eradicate grey squirrels without firing a shot” in 2015, the media has courted the charismatic mammal as the saviour for the UK’s embattled red squirrels. The media message is simple: the return of pine martens will herald the decline or even eradication of grey squirrels, which, since their arrival from North America in 1876, have caused regional extinctions of the native red squirrel. That’s because pine martens supposedly prefer eating greys, while leaving reds alone. 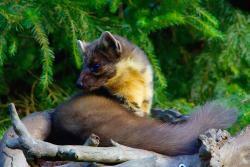 The optimism around pine martens in the UK originated from research in Ireland and Scotland. In Scotland, scientists studied forests containing pine martens, red squirrels and grey squirrels. The more pine martens they recorded using a woodland area, the more likely they were to find red squirrels and the less likely grey squirrels were to be there. Like earlier Irish studies, this suggested that pine martens suppress grey squirrel populations to the overall benefit of red squirrels. However, that’s not quite the whole story. There’s a desire in the media to find heroes and villains in nature which simplifies the situation and obscures the potential impact of a returning predator on British wildlife and livestock. Sadly, ecology and conservation are rarely simple and the restoration of pine martens will not always follow a script. Red squirrels on the menu? Red squirrels are one of many species eaten by pine martens.The Scottish pine marten researchers make clear that pine martens sometimes eat red squirrels. In a small number of other studies conducted elsewhere in Europe, reds were in fact a significant seasonal component of pine marten diet – up to 53% in one case. It’s therefore incorrect to suggest, as some conservation groups have, that dietary studies show pine martens very rarely eat red squirrels. The reality is that predation rates reflect the relative abundance of red squirrels to other prey, encounter rates and local habitat characteristics. Why grey squirrels have declined in the presence of pine martens remains uncertain. The impact of martens on greys may vary geographically and it’s unwise to simply extrapolate the findings from Scotland and Ireland to the rest of the British Isles without a note of caution. Suggesting the pine marten is the best long-term solution for grey squirrel control in England is premature and requires more research to confirm. Pine martens have been absent from much of England for around 100 years, a period of significant agricultural and urban change. Landscapes have altered dramatically and many potential prey species have regionally declined. Pine marten predation upon these could therefore prove to be locally significant. This should not be a barrier to reintroducing pine martens. Instead, it reinforces the need for informed discussions with all interest groups likely to be affected. We must acknowledge that as a last resort, lethal control of predators may be necessary to conserve rare species such as some ground nesting birds. As the pine marten becomes more common in the UK and Ireland, inevitably there will be scenarios where lethal intervention is unavoidable. A pine marten predating a seabird colony was shot in 2018 under licence to protect an internationally important breeding population. Measures to prevent predation of poultry or game birds are frequently recommended where pine marten restoration is occurring. These include the installation of electric fencing, cutting back branches overhanging pens and ensuring that wire netting has no holes martens could get through. While these management recommendations are useful, many people may find it difficult to implement them. As a result, any negative impacts of a returning arboreal predator will fall heavily upon a handful of poultry owners. The return of the pine marten may also complicate the conservation or reintroduction of other species. Although the location and other details are confidential, there were concerns that a pine marten was adversely affecting a red squirrel conservation programme after an individual was found to be regularly visiting release enclosures. As pine martens naturally spread from Scotland into northern England, adaptive and measured responses will be needed to responsibly manage their return. An approach to conservation that’s media-friendly but built on limited evidence rarely works, and certainly won’t in pine marten restoration.